While on an August hike to Hanging Rock Raptor Observatory in West Virginia, I discovered this inconspicuous, and somewhat frail plant growing in the dry, rocky woodlands near the top of the mountain. I later saw the same plant in bloom in a similar habiat, at Wind Rock, near Mountain Lake. This is Starry Campion, a member of the pink family. It is related to Bladder Campion, White Campion, and Fire Pink. Starry Campion is a native perennial that flowers in late summer. 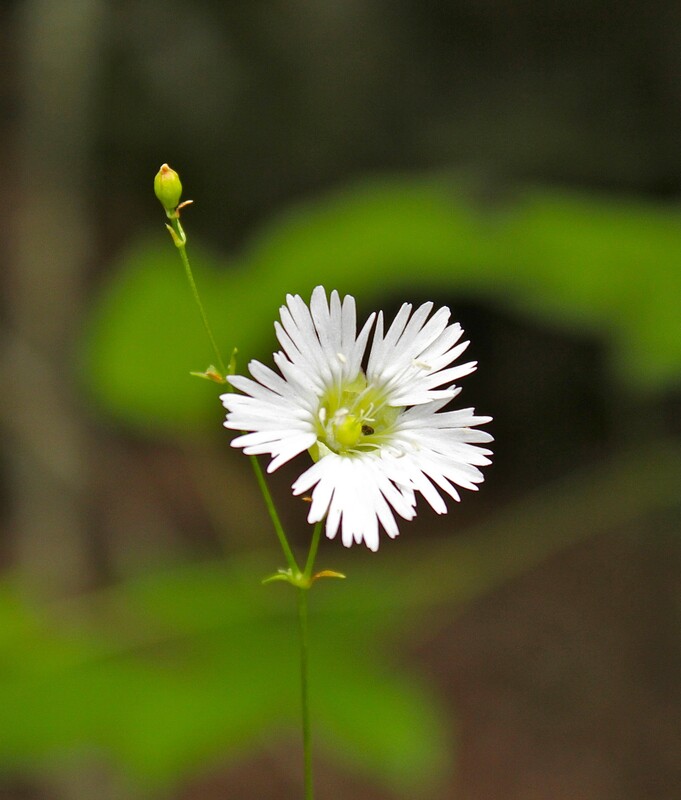 It bears single, terminal, white flowers with five petals. Each petal is ornately fringed. The green sepals behind the flower are united into a bell-shaped cup (the calyx). At the center of the flower, expect to find a spray of 10 greenish stamens. The leaves of the plant vary as your eye travels up the stem. At the top and bottom, the leaves are simple (undivided), opposite, lance-like, sessile (no petiole), and entire (smooth margin). In the middle of the stem, the same-shaped leaves occur in whorls of four. The plant grows to a height of 2-3 feet. Alternative names for the starry campion plant include widow’s frill and catchfly. Bloom time is July through September.